The latest issue of Optima newsletter is now available on the website. 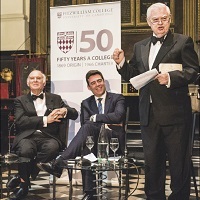 Fitzwilliam: 50 years a College – we hear from two alumni from 1966, Graham Nutter and Peter Phillips, who both remember their inaugural year well. That was then, this is now… - Dr Elizabeth Marseglia writes about her time as the first female Fellow of the College. London Dinner and EU referendum debate – a summary of the 85th Fitzwilliam Society London Dinner, met with exceptional demand, due to the addition of a timely debate on the EU referendum with contributions from Lord Lamont of Lerwick, Sir Vince Cable, The Rt. Hon. Andy Burhnam MP, Marina Wheeler QC and Professor Catherine Barnard. ‘Producing tragedy’ – student James Sutton reports on alumna Adele Thomas’s production of Aeschulus’s Oresteia at Shakespeare’s Globe last year. Fitz and Footlights – Optima editor Alison Carter interviews Fitz students Guy Emanuel, Sam Grabiner, Jordan Mitchell, Theo Wethered and Alex Cartlidge on their Footlights work. Books by members include: a publication on medieval maritime warfare by Charles D. Stanton, a book on the political practices of the Tibetan Government-in-Exile by Fiona McConnell, the latest novel by Catherine Banner, and A Dictionary of Mutual Understanding by Jackie Copleton set in 1940s Nagasaki and modern-day America.